I should have written this post since long, but time is always missing... The topic regards the digital archaeological (vector) drawing on the field. During the CAA conference of 2015, held in Siena Italy), I participate, among others, in the session 9A (Towards a Theory of Practice in Applied Digital Field Methods), moderated by +nicolò dell'unto (Lund University) and James Stuart Taylor. After my speech I was asked if we (Arc-Team), as a professional archaeological society, were really able to perform the digital documentation in real-time during an ordinary excavation. I answered that, at least in Italy, this point is very important for a professional society and that in normal conditions (but this can also happens during most of the emergency excavations) we complete the digital archaeological documentation directly on the field. The reason is simple and it is every year more evident: money are always less and less, as the time goes by, for cultural heritage matters; at least this is the trend of the last decade. For this reason, if on the one hand we have to try to counter this phenomenon, on the other we have to adapt our methodology to the current reality and this means to use the economic resources for the excavation also to produce the related documentation (without counting on a post-excavation budget). The old video below (2014) shows how we manage the digital archaeological drawing on the field with QGIS. The vector layers can be related to georeferenced photomosaic (bidimensional photomapping), or to georeferenced orthophoto (coming from 3D operations based on SfM/MVSR techniques). Of course orthophoto are the best solution, but currently the 3D work-flow with standard hardware is pretty slow. This is the reason why for almost all the palimpsestic documentation we still work with both the system: 2D photomapping and 3D SfM; depending on the time-table we have on the field, we choose the post-processing operations. IMHO, Freehand Editing plugin is a perfect solution for field operation, so that I am planning to add it into qgis-archeos-plugin, for ArcheOS Hypatia. 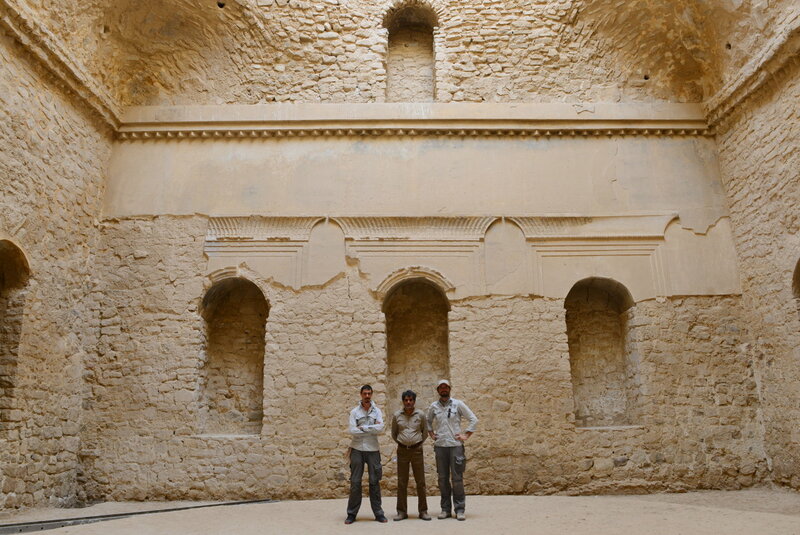 The building is located two kilometers (1.2 miles) north of the ancient city of Gor. The palace complex includes a pond, fed by a natural spring. The structures dimensions are 116 m by 54 m. The three domes are almost 18 m high, the southeastern one is partially collapsed. The structure was built of local rocks and mortar with plasterwork on the insides. After positioning the site with DGPS we've documented the building room by room, applying the structure from motion technology, powered by free and open source applications. In ten days we took about 30.000 pictures from the ground and from our drone, covering the whole building and two Sasanid Rock Reliefs: The Investiture Relief of Ardashir I. and the Equestrian Relief, showing Ardashir's fight against the Parthian king Artabanus V in 224. Our three minutes long clip sketches the 2015-Mission of "Digital Archaeological Documantation of Iranian Monuments" during all it's phases.